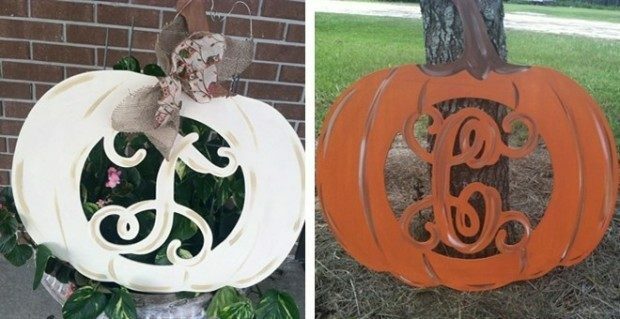 Fall Pumpkin Monogram Door Hanger Only $24.99! You are here: Home / Great Deals / Fall Pumpkin Monogram Door Hanger Only $24.99! Order a Fall Pumpkin Monogram Door Hanger for Only $24.99! This door hanger will take you all the way through Thanksgiving! This HUGE door hanger is approximately 22 inches wide by 22 inches tall. It is hand painted and detailed. No two pieces are exactly alike. Each piece is accented with a corresponding bow and is ready to hang. Please choose one letter for personalization when ordering. These are available in burnt orange, jack-o-lantern, and antique white color options!